Note : 4.4/5, basé sur 45 notes. Can one man defy an army? Only one of the legendary Raithlin would try. But trying is not succeeding - or even surviving. Lanrik is young and untested, but confident in the time-honored skills of the Raithlin scouts. He attempts to slow the horde long enough for a warning to reach his home city. But a single act of treachery, timed to devastating effect, tests him as much as the enemy. He forms a bold plan against overwhelming odds to protect all that he loves. But his choices lead him ever deeper into a life-changing struggle. Dark forces of sorcery and witchcraft are on the move. So too are the powers that contend with them. The conflict draws him into a quest for the safety of the whole land and toward a girl who comes to mean more to him than anything. He enters a world of magic: sometimes beautiful, often perilous and always unpredictable. 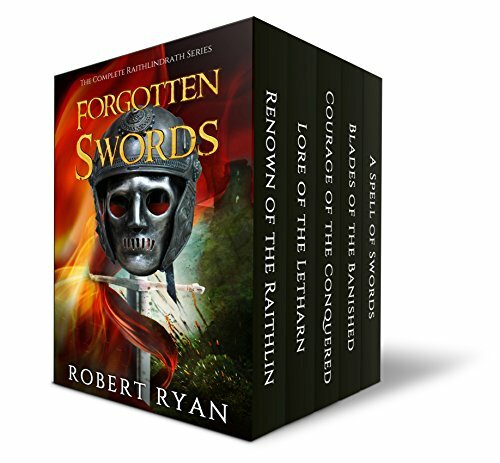 This boxed set contains all four books of the completed Raithlindrath series. As a bonus, it includes A Spell of Swords, the prequel to the Amazon Epic Fantasy bestseller Raging Swords.